II have been married to a very patient, loving, and beautiful wife, Barbara Ann Sherman (Maranka) since 2004. 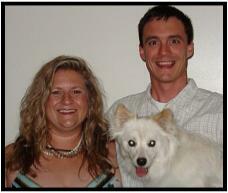 We have an American Eskimo Mix Breed dog named Sadie. I have been a Registered Nurse at McLaren Greater Lansing Hospital since 2006. I earned my Associate's Degree in Nursing (ADN) from Lansing Community College and my Bachelor's in the Science of Nursing (BSN) at Michigan State University. I was a mobile disc jockey at Electric Horizons DJ for 23 great years. I also wired firetrucks at Spartan Motors in Charlotte for seven years and was a medical assistant at the Family Medicine of Michigan in Grand Ledge for four years. My recent hobbies and interests include: Amateur Radio, watching TV and movies, firearms, landscaping, home construction, and anything computer/technology related. I also enjoy outdoor activities, even in the winter. My name is William "Kim" Sherman and I was born in 1974. My father (K8VEB, formerly WA8PEJ) has been a ham since childhood. He remains very active in amateur radio. I, too, took interest and earned my first ham radio license when I was a young teenager with the callsign of KB8EKV. At age 14, I upgraded to Technician with a callsign of N8KRN on 4/25/89. Unfortunately, I lost interest and let my license expire. I once again gained interest in amateur radio. In October 2013, I earned my Technician and General license with a callsign of KD8VUL but changed it to WA8KIM.